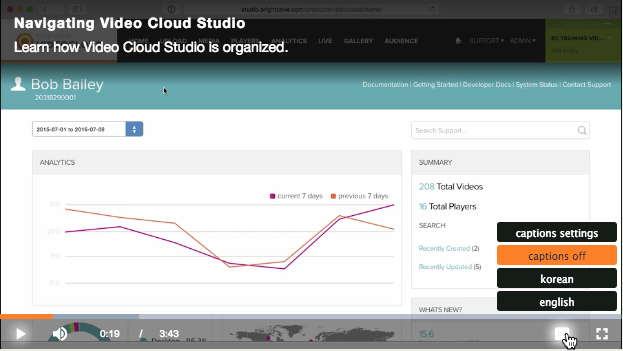 Captions can also be configured using Video Cloud Studio. For more information, see Adding Captions to Videos. To add captions to a video, you first need to create a caption file. The Brightcove Player requires that captions be in Web Video Text Tracks Format (WebVTT), SRT or DFXP format. The WebVTT file format is in plain text and contains time text data followed by the desired caption or subtitle text. A portion of a WebVTT file is shown below. you can accomplish using it. For more information on the WebVTT format, see this link. You should have a separate caption file for each language you need to support. While there are many third-party tools to help create captions files, Brightcove has several partners that provide transcription, captioning and translation services. For a complete list of Brightcove partners, visit the Partners section of our website. If you are using Dynamic Delivery videos, you can also ingest SRT or DFXP captions, and Brightcove will convert them to WebVTT automatically. See the Ingesting WebVTT Files (Text Tracks/Captions) document for more information. In Video Cloud, you can add your WebVTT captions to a video, either as a remote asset that you host, or by ingesting it into Video Cloud. Once you do that, the Brightcove player will automatically add the captions when it loads that video, and display the CC button in the player controls. For more details on adding captions to videos, see Working with Captions. The <track> tag is used to specify subtitles, caption files or other files containing text, that should be visible when the media is playing. The steps to do this are outlined below. Note that 2- or 4-letter language codes can be used for the srclang attribute (e.g. en or en-us). Generate the Advanced (In-Page) embed code for your player. This can be done using the Media module or the Players module. To the <video-js> element, we added an id attribute with a value of myPlayerID. This is needed to get a reference to the player in step 3. Add <track> tag(s) inside of the <video-js> tag that point to location of all caption files. Player Studio does not currently provide a way for publishers to upload WebVTT caption files. The URL for the caption file location must be less than 250 characters. In the example below, English, Japanese and French caption files have been specified. For a complete list of language codes, see the HTML Language Code Reference. Publish the page with the player. When a player with associated captions is published, a CC button will appear on the player chrome. Click the CC button to select a caption language and display the captions. Note: For viewers on iOS devices, when viewing videos with captions and ads, we suggest that you explicitly select a track and not set captions to Auto (Recommended) when the video is playing. Using the Auto (Recommended) setting may display incorrect subtitles for ads. Note that using the Auto (Recommended) setting does not affect the captions display for the actual video. Viewers will see video captions for ads but once the video starts playing (pre-rolls) or resumes (mid-rolls), captions will appear as expected. In this section you will see how to programmatically style captions. For information on styling captions by altering the WebVTT file, and also the UI in the player, see the Styling Captions document. The window is the cyan colored rectangle that is nearly the full width of the player. It is common NOT to use a window, hence the default opacity is 0. Another method that could be helpful when styling captions is player.textTrackSettings.saveSettings(). This method saves to the browser's localStorage the current settings of caption styling. The following screenshot from Chrome's Application tab shows the local storage for the page serving the player and the name of the key, vjs-text-track-settings, and its associated values. This method gives you the possibility to configure the caption styles using the player's UI, then save the settings and copy the values to use with player.textTrackSettings.setValues(), as shown above. The function call returns an object of type vjs.TextTrack. You must wait for the loadedmetadata event to be dispatched before you use the addRemoteTextTrack() method. The following example shows the script block for adding English and French captions to a video. The complementary method textTracks() enables you to retrieve all text tracks assigned to a player. The method returns an object of type vjs.TextTrackList. Up to this point in the document captions have been delivered as a separate file and associated with a video through the <track> element. This type of captions is sometimes referred to as out-of-band. The alternative method involves embedding the caption data directly into the video content, frequently live video streams, and is sometimes called in-band captions. Brightcove Player has support for in-band captions, and hence Live with captions, built into HLS, therefore no plugins are needed. Brightcove Player's implementation will work everywhere that native HLS isn't used. If native HLS is being used, support for in-band captions is OS and browser dependent. For instance, iOS's native HLS has full support for in-band captions. Captions are supported on the following device types and operating systems.